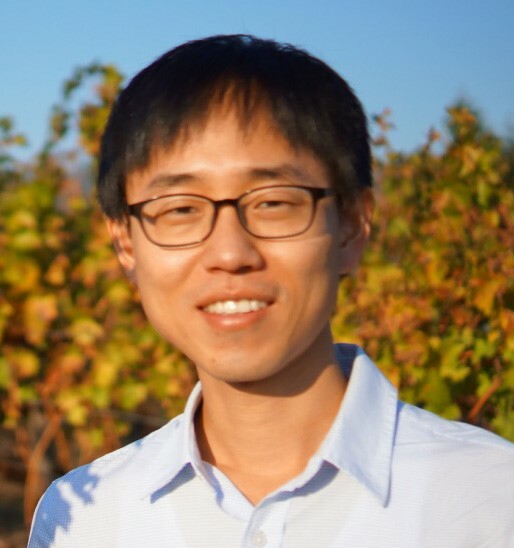 The Youngkwang Lee group applies advanced imaging and spectroscopic techniques to solve important problems in cell signaling and develop novel biosensing platforms. With an emphasis on optical analyses, we use research methods from multiple disciplines — biophysics, biochemistry, materials science and nanotechnology. We integrate these tools into our research program to quantitatively analyze biomolecular reactions at single-molecule resolution. The research program in the lab has two main areas of interest described below. Many of cellular processes involve a series of biochemical reactions that take place on membranes. The importance of membrane reactions is underscored by the fact that more than 50% of current drugs target membrane proteins and many of cytosolic proteins are fully functional only within membrane environments. Reactions on membrane surfaces are intrinsically different from those in solution. Proteins experience enhanced local concentrations, orientational and conformational change, restricted diffusion, and physical assembly with their interacting partners; as a result, many emergent properties arise at the membrane. However, a relative lack of methodology for quantitatively analyzing membrane processes effectively hinders our understanding of cell signaling. A major focus in the lab is to solve this challenge by bringing in new technologies. A key idea is to reconstitute signaling reactions on a supported lipid bilayer (SLB) in a highly controlled manner. A suite of cutting-edge single-molecule fluorescence imaging and spectroscopic techniques are employed to quantitatively elucidate detailed molecular mechanisms. Remarkably, single-molecule readout is achievable even with direct cell extract. Our approach is generally applicable to other systems, beyond membrane signaling. Overall, we apply chemical and physical principles to understand complex biological phenomena, seeking to leverage our discovery to develop better therapeutic strategies. The current projects include molecular assembly and activation of small GTPases and Raf kinases at the membrane. Quantification of extremely low-abundance biomolecules (e.g. nucleic acids and protein) is of tremendous importance for applications such as early diagnosis, adjuvant therapy, food safety monitoring, and biological warfare defense. We aim to develop novel optical sensors by synthesizing functional nanostructure/biomolecule hybrids. Our primary synthetic building blocks include plasmonic nanoparticles, artificial cell membranes, DNA nanomachines and recombinant proteins. The ultimate detection sensitivity of the hybrid sensing system is at the single-molecule/particle level. Students working in my lab will be trained to be skillful at a variety of cutting-edge imaging and spectroscopic techniques including single-molecule total internal fluorescence microscopy (TIRF), dark-field microscopy, fluorescence correlation spectroscopy (FCS), single-molecule fluorescence resonance energy transfer (FRET), and time-correlated single photon counting (TCSPC). Additionally, they will receive an interdisciplinary training to build a broad background in nanoparticle synthesis, surface chemistry, nano/micro fabrication, high-throughput data analysis, and protein purifications. If you want to learn more about research in my lab, please contact Prof. Youngkwang Lee via email. We are always looking for graduate and undergraduate students in pursuit of excellence in science!